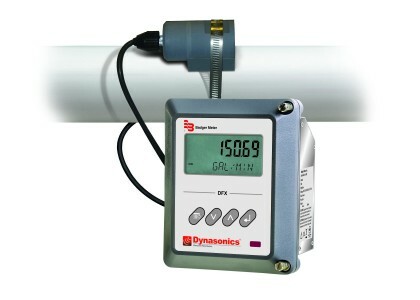 Dynasonics DFX Doppler Flow Meters provide accurate and reliable flow measurements in closed pipe, liquid systems. The DFX ultrasonic Doppler flow meter measures flows of liquids containing suspended particles or aerated liquids. The suspended particles must reflect ultrasonic energy. The DFX flow meter operates by transmitting ultrasonic waves into the flow stream and measuring the frequency shift of the reflected wave. The meter’s clamp-on design allows quick and low-cost installation, and eliminates worries of fluid compatibility and pressure head loss. With no moving parts, there is no mechanical wear, so repair kits or replacement parts are not needed.